When designing stormwater facilities, El Paso Water incorporates amenities, wherever feasible. Park ponds have a dual purpose of reducing the flood risk and improving quality of life. Each is developed in coordination with the City of El Paso Parks and Recreation Department. The utility has converted a number of barren ponding areas, which were once eyesores in the community, to landscaped park ponds featuring landscaping, benches and more. Austin Pond is one of several projects in Central El Paso that improves flood control in the Government Hills drainage system. The $2.2 million project was completed in 2016. The pond collects about 3.5 million gallons of stormwater, keeping it off neighborhood streets. Wrought-iron gates surround the pond along with walking paths, landscaping and a shade sculpture designed by Creative Kids for the neighborhood to enjoy. Pollard Park Pond in Central El Paso was completed in 2016. Neighbors and community leaders expressed appreciation for improvements they say have deterred illegal dumping and improved the overall look of the area. Jorge Almada, president of the Central Neighborhood Association, had been trying for years to get the strip of land cleaned up. He finally saw his efforts come to fruition when the park pond was completed. "This used to be an empty lot full of weeds, trash, mattresses," he said. "Now look at the difference." Pollard Park Pond is one of several projects designed and constructed to improve flood control in the Government Hills drainage system. The project increased the pond's capacity, wrought iron gates replaced chain-link fences, and new landscaping was introduced that included new trees, plants, a walking path and benches. 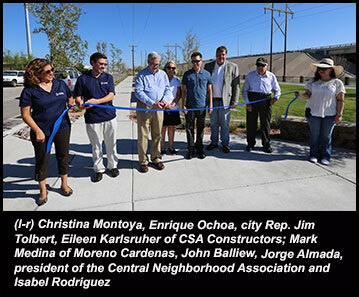 "We were able to take this vacant piece of land and build this beautiful facility, and we really appreciate the input of the community," said El Paso Water President and CEO John Balliew. "This is the culmination of all that effort. Park ponds have a dual purpose of reducing the flood risk and improving quality of life. Each is developed in coordination with the City of El Paso Parks and Recreation Department." "El Paso needs park ponds as part of the essential stormwater infrastructure," said then-City Rep. Jim Tolbert. "It doesn't rain often around here, but when it does, look out. "At the same time, these ponds can serve a recreational role. In District 2, we certainly need access to more parks, and features such as park ponds help us to do just that. It has had a positive impact on the neighborhood." Pollard Pond is one of four capital projects completed in the Central stormwater system. The pond can collect up to 740,000 gallons of stormwater and convey most of it to the Pershing Dam, east of US-54. The pond also diverts some water into the Government Hills Channel.